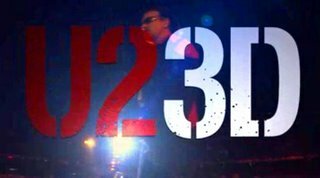 I went to see the new U2 3D movie at The Bob Bullock Texas State History Museum. It’s not a traditional movie with a storyline and a plot; but full songs from a concert (in Buenos Aires) recorded in 3d IMAX glory. The sound is fantastic and way louder than your average movie, and the visuals are amazing. The music you already know it. I recommend you check this one out, if only for the audio/visual experience. To my surprise, even my mom liked it, and she hates “loud music with drums“. I should have gone when I was in Austin, damn!. It says a lot that the latest U2 stuff is appealing to moms that do not normally like loud music with drums. They can definitely still put out a great show, but they are getting old.